The powers behind the Damon-Bourne series of films rode their gem for three films, tracking the titles if not the spirit and details of Ludlum's novels. If you read some of the insider's statements, it is not hard to see that the filmmakers had trouble coming up with the two last Bourne films. Writers Block and the Wall of Originality stood in their way. But Hollywood likes a successful franchise and they marched onwards to box office success. Technically The Bourne Ultimatum should have been the end. What else could plausibly (where plausibility enters the picture on the road to Die Hard 5) happen to one Super Spy/Elite Assasin in one lifetime? Along came The Bourne Legacy, what appeared to be a beating of a well dead horse. But it is the best Bourne yet, thanks to Tony Gilroy. Gilroy has been the writer on all the Bourne films and also directed Legacy. The central problem of the film is completely set up by the 20 min 30 sec mark. Gilroy covers an enormous amount of story in those first 21 minutes. He masterfully introduces Aaron Cross, a second generation version of Bourne played by the excellent Jeremy Renner. Gilroy does this in 8 sequences, of which only two are more than a minute long. 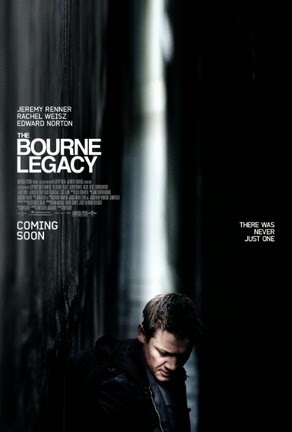 He ties Legacy to the previous three Bourne movies. He gives background on the second generation program, itself a study in giving just the right amount of information. It is a tour de force of writing and directing to pack in so much story in so little time. The pacing is remarkable. And the first extended action sequence does not let you down. I especially enjoyed the opening winter training scenes. I also appreciate the absence of the shaky handheld camera shots, a motion-sickness-inducing feature of the earlier Bourne films. If there's anything that I felt was not done right - and there's not very much - then it would be the closing action sequence in Manila, where Cross is involved in a Parkourisque chase scene across shanty roof tops. This has already been overly done in Ultimatum and Casino Royale. No matter, I'm really hoping that Gilroy continues his hot streak with the next Bourne film.